People go crazy for brunch! It seems that breakfast and brunches are enjoying a resurgence in popularity these days. 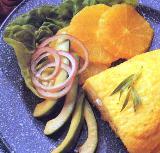 Brunch foods are a welcome change for the host because they can be light and easy to prepare. Brunch menus are open to just about any food. Although we always think of brunch as breakfast and lunch, you can also prepare brunch with no or limited breakfast foods. Let your imagination and taste buds go wild and consider foods you may not ordinarily serve for breakfast such as seafood, steak and pasta. Keep everything fresh, seasonal and not overly filling. Make sure to include fruit juices, mineral water, milk and tea. Pull out the expresso or cappuccino maker and offer specialty coffees as well. This is especially important for a brunch party unless you like to rise at the crack of dawn to prepare the meal. Brunch is traditionally served between 11a.m. and 1 to 3 p.m. and is normally presented buffet-style. Avoid too many dense, rich foods. Brunch should start your day--not put you back to sleep. It is unlikely that all of your guests will be vegetarian so compliment this all veggie brunch with an egg dish and Rum and Pineapple Glazed Ham or Easy Baked Citrus Chicken. Serve with coffee and sparkling cider. This is a big buffet menu, but is light, pleasing and very easy to prepare. Perfect for a bridal shower brunch. 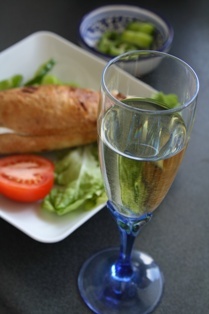 Serve champagne before and during the meal. One year my annual Easter Brunch almost didn't happen because of a rushed scheduled. This is what I pulled out of the hat. I served with Mimosas, iced tea and coffee. Toss cooked angel hair pasta with olive oil, lots of minced garlic, pinch of hot red pepper flakes, lots of softened butter and shredded Parmesan cheese. Keep in a low oven while other dishes are finishing and cheese is melted. I was amazed that this simple dish was the hit of the brunch! Mix plain yogurt with a dash of vanilla or almond extract. Top with lemon curd, granola, cut fruit (such as any berry or peaches) and toasted almond slices. Variations: Try flavored yogurt such as lemon, peach, vanilla or strawberry. Use crumbled brown sugar, oatmeal or even chocolate chip cookies in place of the granola. Use a fruit jam or other types of nuts. Fruits are not at there best by Easter time, so I won't tell anyone if you use canned fruit. The combinations are deliciously endless and easy! Because of a previous year's near debacle (meaning not up to persnickety standards), I took the time to plan this Easter brunch. It turned out pretty great. Cooking Brunch for a Crowd? of information to help you cook for a large number of people and still maintain your sanity.